As far as trailers go, Doepker Industries’ Legacy is a head-turner. But this made-in-Saskatchewan product is more than just a pretty hauler of grains, pulses and fertilizers. As one of the premier trailers in the world for the agricultural market, the manufacturer’s latest innovation is raising the bar among its larger competitors. Made almost entirely of aluminum, the new bulk-hauling trailer is the lightest and most durable product of its kind, according to Evan Doepker, president and chief executive officer of Doepker Industries. His company has been making trailers for a wide variety of industries for more than 70 years. It could come as a surprise to some that a mid-sized firm of 400 people headquartered in the small village of Annaheim, just northeast of Humboldt, Sask., could produce a trailblazing trailer for the agricultural industry. But those in the agricultural manufacturing sector know Doepker is one of several global success stories located in the Humboldt region — also referred to as the Iron Triangle. The points of the triangle refer to Doepker, as well as air seeder producer Bourgault Industries in St. Brieux and Englefeld’s Schulte Industries, a maker of shortline agricultural equipment such as snow blowers, mowers and tillage equipment. Other manufacturers to blossom in the region include: Humboldt-based CIM (Commercial Industrial Manufacturing), a builder of steel products such as truck boxes; Koenders Manufacturing, an Englefeld business that specializes in plastic moulded products for the recreation and agricultural industry; specialty tarp maker Michel’s out of St. Gregor; and Highline Manufacturing in Vonda, which found its niche building rock-pickers and balers. This important manufacturing hub developed naturally and was very much built around the needs of local farmers, says Doepker. “I think you’d find that most of the manufacturers in the area have their roots in the creation and development of some type of product that local customers required,” he says. “A prototype was built, tested, used and improved upon with close customer input. In many cases, the product was literally used by a neighbour in a field next to the manufacturing site. 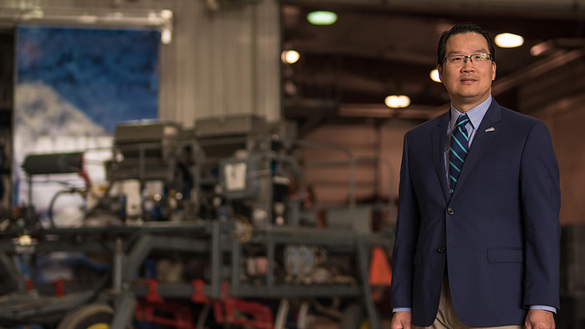 David Yee, vice-president of the Prairie Agricultural Machinery Institute’s (PAMI) Saskatchewan operations located in Humboldt, attributes the economic successes in the Iron Triangle to a “can do” attitude paired with strong entrepreneurial spirit. “As success grew for the early few, others came around because of the growing convergence of manufacturing know-how and the skilled labour force available,” says Yee. Fast-forward to today, and its role has changed from merely evaluating equipment to helping local companies develop solutions for the farming industry in Saskatchewan, across Canada and beyond. As such, PAMI works very closely with industry, Yee says. Saskatchewan’s manufacturing industry — valued at about $4 billion annually — gets a significant portion of its economic generation from about two dozen agricultural companies spread across the province. While they might be smaller in stature, all these firms have outsized impacts because of a laser-like focus on innovation and their proximity to customers — Saskatchewan is the world’s breadbasket after all. “Many of these companies have been very successful in the ‘big iron age,’” Yee says, referring to machinery that adopted hydraulics and other mechanical innovations to help farmers achieve exponential growth in yields over the past several decades. Increasingly, manufacturers are building connected, automated products that help farmers improve efficiency. “A good example would be if you take any air seeder (which was invented in Saskatchewan, incidentally), it’s now designed to ‘talk’ with a third-party company so it can connect and provide information at the rate it drops seeds and applies fertilizer,” Yee says. The reason for these advances is competition for business — farmers are entrepreneurs who demand the latest technology to drive yields in a sector facing intense price pressures. For example, costs for inputs such as seeds, fertilizer and fuel are generally rising while margins are shrinking, pushing farmers to seek the latest equipment and innovations to boost profit, Yee notes. The province’s history of innovation is further boosted by government programs such as the Saskatchewan Commercial Innovation Incentive, which qualifies businesses for a lower provincial corporate income tax rate when they commercialize their intellectual property in the province. Innovative design has certainly given Doepker an advantage. Its Legacy trailer was created with the price-conscious, tech-savvy farmer in mind. “As our customers become more focused on the data regarding their business, their appreciation of the weight savings of our trailers becomes more evident,” Doepker says of the Legacy, which is more than a ton lighter than its competitors’ products because of its highly engineered design and aluminum construction. “That means that much more payload can go into the trailer, which creates a more profitable experience for the customer and reduces the number of trips that need to be made, leading to fuel savings and an environmentally friendly, greener solution,” he adds. This kind of innovation is a product of the home-field advantage enjoyed by firms operating in the Iron Triangle and the province as a whole. “Together, we can find solutions to make farmers more successful,” Doepker says. This story was created by Content Works, Postmedia’s commercial content division, on behalf of the Government of Saskatchewan.